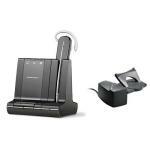 Plantronics Savi W740-M Expert Reviews - Read Reviews and Buy Smarter Online. Verdict: High end system with all of the features you would want. Best to try over the ear style headset before buying. If you prefer a traditional headset consider the Plantronics Savi 730 instead. Verdict: All functionality is great other than audio quality from the computer. Music is extremely muffled and low quality. When I chatted with support they simply said "it's not designed for that", however my last USB headset (single ear Jabra) produced crystal clear music audio quality. A shame, really. Verdict: I love this! Replaced older model wireless headset. This is perfect. Sound clear as a bell. Paired very easily with cell. This has a much longer range than the standard bluetooth. I purchased a second batter and portable charger thinking the charge may not last all day. I was wrong. Great product...met all my expectations! Verdict: Vewry easy to install. Works great with my bluetooth smartphone and works very well through my laptop... Has headset or very light weight fitkit for my ear plus a great selection for fitting to pick from. I would recommend this device to anyone! Verdict: I have had this model for over six months and love it! So easy to sync with your office and cell phone, plus it is super light and comes with several types and sizes of ear pieces. You can perform several functions directly from the earpiece away from your desk, and the sound is crystal clear. Pros: 1. Superior call quality. 2. Excellent noise cancellation. 3. Support for multiple modes of communication: *** Skype *** Lync *** Mobile Phone *** Landline *** WebEx 4. Ease of Use 5. It's a Plantronics headset, you wouldn't be looking at it if you didn't already know they build superior products. Verdict: If you haven't bought this yet, buy it now. Verdict: I have had this device for about 30 days it works fantastic four what it was designed to do. That is answer my cell phone my landline phone and interact with my computer. It works great with Dragon Naturally Speaking. Verdict: I originally purchased this to only replace my office handset which I was tired of wedging between my shoulder and ear. I thought that the PC connectivity and Bluetooth were features that I'd never use, but now I find myself using them all the time. Verdict: Its not often that I'm impressed enough to want to write a review about a product. However, this is one of the exceptions. I've recently started working from home on a permanent basis. I have a lot of calls a day. They happen via landline, mobile, MS Lync and Cisco Softphone. Verdict: Product did everything it was supposed to do effortlessly: land line, mobile phone, and PC (Dragon). Only quirk is that it WILL need the lifter for this model even though our CISCO 7965 phones already have a "headset" feature. Verdict: Really light. Got these for our office. OMG. So good. Verdict: A little fiddly to get it set up initially but has been fantastic since! Verdict: I've used multiple wireless Plantronics headsets for the office and this is the very best yet. Lightweight and great features with PC, Mobile, and Desk Phone.